Fill up your Easter baskets with Sweet City Candy's mouth-watering chocolate and candy eggs! Watch the kids eyes light up when they find a luscious Cadbury Crème egg on an Easter egg hunt! 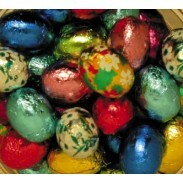 Sold in bulk, we offer a huge variety of popular Easter treats from Cadbury, Hershey, Madelaine, Palmer, and others. Make the Easter egg hunt extra sweet with foiled Madelaine solid milk chocolate Easter eggs, mini robin eggs, speckled eggs, bunny bites, Thompson dark chocolate eggs, Cadbury mini eggs or Hatchables Chick 'n Twists. 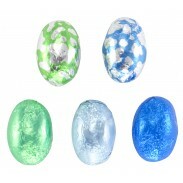 At Sweet City Candy you'll meet all your chocolate Easter egg needs at the lowest wholesale prices available. Sweet City Candy's entire selection of bulk chocolate Easter eggs is listed below. If you have any questions about our chocolate Easter egg selections, visit our FAQ section or contact us for more information. Our friendly staff will be happy to answer any questions you may have about foil-wrapped chocolate Easter eggs and more.